A biologist by training, found in photography the way to approach his other passion: Nature. Works as a professional image as camera control and director of TV cameras, activities closely related to photography. Collaborated on many TV programs K2000 producer for 15 years, especially for ETB and Tele 5. Currently works as a "Picture Control" in the production Bainet in their programs: Kitchen Argiñano, Bricomanía, Decogarden, Fronton, etc. Regularly presents its collections in exhibitions in Bilbao, Madrid, San Sebastian, Valladolid, Zarautz, Pamplona, Basauri, etc. having made more than 50 exhibitions. In 2008 he participated in the exhibition "A coast, four eyes" in the room on Boulevard de la Kutxa Donostia.Participa as Jury of prestigious national competitions in Gasteiz, Eibar, Bilbao, Zumarraga, etc. His specialties are landscape photography Natural and travel reports. 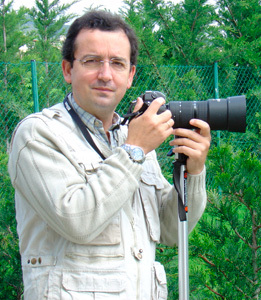 It is a founding member of the group of landscape artists: PortfolioNatural.com.Ha published articles in travel magazines, "Euskalherria, " "Pyrenees, " "Travel and Vacations", "travel ", "National Geographic V ", etc. ; in books of landscapes: "Orduña door Manor ", "Spain's unique trees, etc. and collaborations with various newspapers.